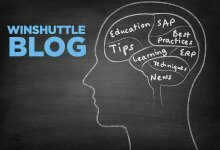 One of the first things I did when I joined Winshuttle was to overhaul the website. Well it has now been over 2 years since we did that and a lot of water has passed under the bridge. Not only has Winshuttle more than doubled in customers, revenue, employees, and nearly every other category I can think of, but our product portfolio has dramatically expanded as well. This creates an interesting challenge as we develop our new marketing website. Our original application, TRANSACTION, is a tool that enables a range of problems to be tackled and solutions to be developed, so working out which to highlight on the web, was (and remains) a challenge. Thanks to the fine efforts of our product team with QUERY, DIRECT and FORMS – the whole STUDIO family – this problem is now compounded. Luckily for us, we have gotten a little smarter over the past 2 years and have gathered a lot of customer data and Winshuttle log files. This data has enabled us to identify the key processes and transactions in each module and department, where we know our software can save customers A LOT of money. Being able to prioritize the content this time around based on data, I know we’ll produce a much better website for customers, partners and prospects. We just got the first round of home page designs in and we can’t wait to unveil the new site in December.